Published on July 31, 2018 in Winnipesaukee Resort. Closed Tags: lake winnipesaukee hotel, restaurants near weirs beach, weirs beach restaurants. Located just five minutes down the road from the Summit Resort is the popular area of Weirs Beach located on the southern shores of Lake Winnipesaukee. There are an abundance of places to eat with lakeside views and outdoor seating, so whether you’re looking for something more upscale, a quick bite, seafood or ice cream we have it covered with our list of Weirs Beach Restaurants listed below. Enjoy a meal with a view at Anthony’s Pier Restaurant located at the end of the Weir’s Beach Pier. With indoor and outdoor seating, grab your favorite seafood specialty including their signature Lobster Roll or Clam Chowder. After spending a long day at the Beach, this is a great option for either lunch or dinner. Anthony’s offers great entertainment Friday and Saturday night with live bands and Fireworks every Friday night at 10pm. For more information on this Weirs Beach Restaurant visit their website. 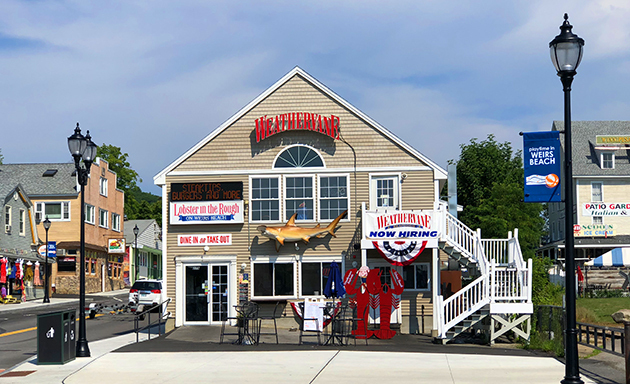 Located along the Weir’s Beach Pier, Lobster in the Rough, a Weathervane Seafood Restaurant is open during the summer season and offers your classic beach fare. With fried seafood baskets, lobsters, steamers, and non-seafood options this is your destination for lunch or dinner after a long day at the beach. 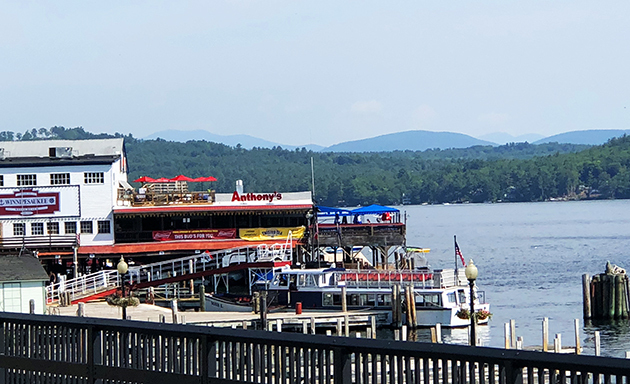 Just a short walk from Weirs Beach or a five-minute drive from the resort the Lobster in the Rough is a great option to sit along the pier and take in beautiful Lake Winnipesaukee. For more information and a menu visit their website. The Paradise Beach Club, “where life is cool”, is located on the Weirs Beach strip and offers delicious eats and entertainment whether you come by land, car, or boat. They serve up delicious ice-cold specialty cocktails along with great food off of their pub menu that includes fried lobster bites, pizza, soft shell crab, and more. Head outside and enjoy their tiki bar on a sandy beach with lounge chairs and live music. The Paradise Beach Club brings in local bands every weekend where the fun is never ending. For a calendar of events and more information about the Paradise Beach club check out their website. Tower Hill Tavern is a Weirs Beach Restaurant that sits at the end of Lake Winnipesaukee. This family restaurant and bar serves up delicious and fresh classics like steak and cheese, lobster rolls, seafood and beef. They even offer a vegetarian menu! The Tavern hosts live music and karaoke throughout the week. 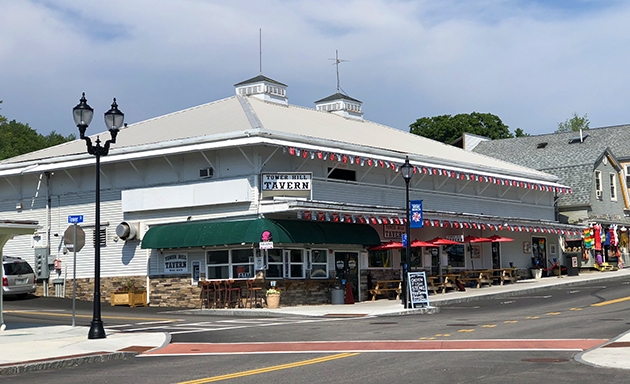 Whether you are already on Weirs Beach or strolling the boardwalk, head to Tower Hill Tavern for a good time. For more information and a full menu check out their website! Sawyers Dairy Bar located down the road from the Summit Resort serves up some of the most delicious ice cream and American fare food in the area. Their food menu offers favorites from lobster rolls, fried seafood and New England Clam chowder to burgers and chicken tenders. Their ice cream is handmade in-house and they have been in business for over 70 years. Ice cream flavors change weekly, so follow their website or Facebook page to see what they have coming out next! Head to The Patio Garden Restaurant where they are serving up Italian and American cuisine. 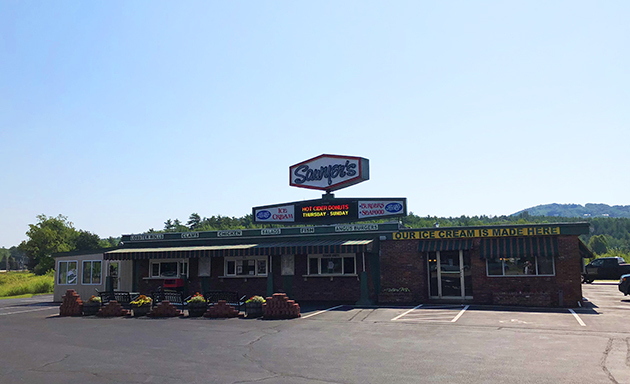 Located on the end of the Weirs Beach boardwalk you can find this restaurant tucked away behind the Winnipesaukee Marketplace. During the summer months enjoy outdoor dining on the patio or in their screened in porch to provide some shade. They also have an indoor air-conditioned dining area if you would prefer to sit inside. This unique spot allows guests to create their own pasta dish and enjoy a delicious lobster roll or steak tips. There really is something for everyone. For a full menu and hours visit their website.